Demos 4, 5 and 6 come courtesy of our friend Brian Brylow: thanks, Brian! Massive range of sound-creation potential with classic analogue warmth and scale: 2.6Gb of compressed data across over 2400 samples • Built around Roland’s flagship SH-7 but taken much, much further • Extensive sound-shaping capabilities including 5 oscillators, 4 envelopes, 3 LFOs, switchable Low Pass filter and twin High Pass filters, Pulse Width Modulation, Performance Controls and more • 40 External waveforms bring a range of superb vintage synths into the mix • Over 150 hand-crafted factory patches and the ever-popular Glitch control to make rolling your own as easy as clicking a button! 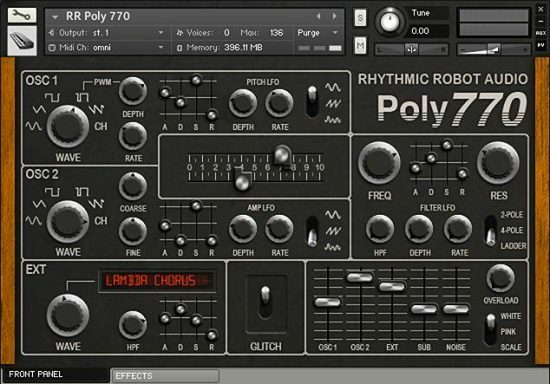 The Roland SH-7 has been the cornerstone of the Rhythmic Robot studio for several years now. We love it for a lot of reasons: the almost modular level of modulation control; the raucous oscillators and slightly insane ‘organ stop’ additive layer; its unpredictable forays into Radiophonics Workshop territory. It’s a little sound sculpting paradise in khaki green and black. The core sound of SH Studio comes from the SH-7’s two principle oscillators. 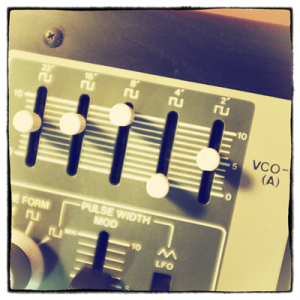 VCO-1 and VCO-2A offer up the classic analogue waveforms: Triangle, Ramp, Square and Pulse. You can dial up a pulse width of your choice or put the Pulse wave under the control of an LFO for lovely lush pulse width modulation. The samples for VCO-1 and VCO-2A aren’t just duplicates of each other: we actually bothered to sample the SH-7’s two oscillators separately, because there are some lovely (and very analogue) variations between them which you’d miss otherwise. So simply layering a VCO-1 Ramp with a VCO-2A Ramp already gives you a wonderfully warm, rich sound. Each main oscillator has its own LFOs, which offer waveforms from sine to random, and can be assigned to amplitude or pitch independently; and they can be detuned against each other for subtle or extreme wonkiness. VCO-2A also has a coarse tuning control in addition to its main Range knob, so you can get fifths, fourths and other intervals going. In addition, there are three further oscillators: VCO-2B gives you five footages of ‘organ stop’ waveforms. 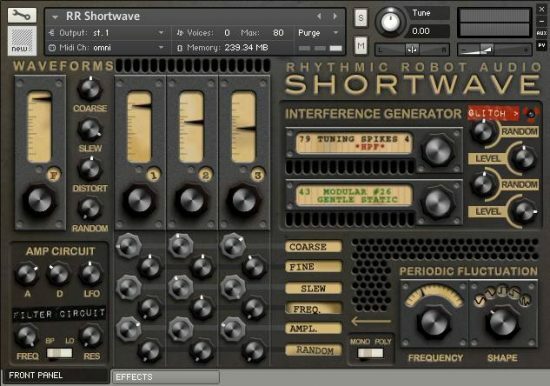 On the original SH-7 this is square-wave only, but here we’ve expanded things a little, giving you the choice of Ramp or Sine as well – since the Sine wave doesn’t feature on the two main oscillators, it’s useful to have it here. 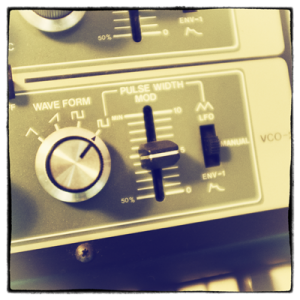 (This is an analogue sine wave sampled from the Yamaha CS-30.) You can use these to add glimmer, or a sub-bass, or whatever you like. They follow the same envelope contour as VCO-2A, but can be mixed independently. Noise comes in three flavours: White, Pink and (Korg 770) Scale, which has a pitched component and which we really dig. 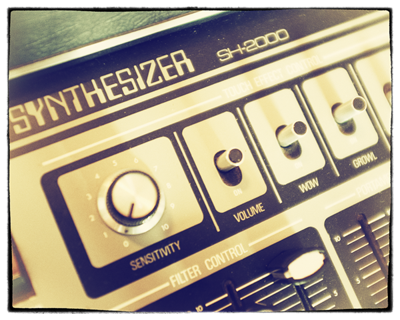 And of course the External wave input allows you, from the second pane, to choose one of forty External sounds, which cover both further useful synth staples (SuperSaw from the Jupiter 6, for example, or wind noise from the SH-2000) and fully-fledged patches, complete with filtersweeps and other goodness. These have their own Envelope Generator and a dedicated High-Pass filter circuit to help them blend seamlessly into whatever you’re dialling up with the main controls. 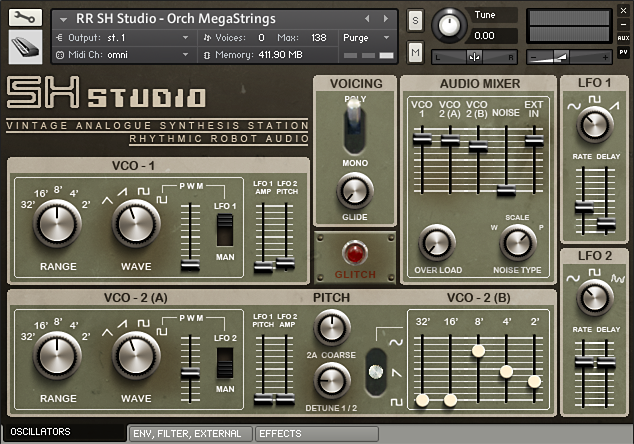 The External waves are an extremely powerful weapon in SH Studio’s arsenal: if you’re reaching for a bass patch, you can bring the Jupiter 6‘s hefty waveforms to bear on it; if you want strings, you can rope in the Logan String Melody II to help you out; if you’re after something swooshy and ethereal, why not add a splash of the Korg Lambda‘s stereo ensemble to the mix? In fact, the external instruments available via the External pane also include the Jennings Univox, Korg 770, Korg PolySix, Roland RS202 and Roland SH2000… all available at the twist of a dial to add their signature sounds to your creation! Once you’ve got some waves cooking, you can get creative with them: the main Filter circuit offers both 2-pole and 4-pole variations, plus a High Pass dial for thinning out the low end. The filter has its own LFO plus an Envelope Generator. Sweep away! Round the back are some classic Effects – Reverb, Chorus, Phaser, Delay, Rotary Speaker and an Amp Cab sim, plus extra ‘performance’ modulation controls. These route MIDI Velocity and your keyboard’s Mod Wheel to either or both of Amplitude and Filter Cutoff, which makes it a breeze to dial up sounds that get louder and brighter the harder you play, or which can be solo’d with one hand and swept with the other riding the mod wheel. We’ve put these to good use on some of the factory patches: Mod Wheel Leads do exactly what you’d think, while various brass stabs, keys, synth textures and basses behave in a really dynamic way depending on how hard you thump them! The end result of weeks of sampling and editing, followed by further weeks of programming and refining, SH Studio is designed from the ground up to be – as its subtitle suggests – a Vintage Analogue Synthesis Station: the equivalent in software of a pride-of-place vintage synthesiser CV’d and audio’d up to a studio’s worth of additional gear. Not so much a single synth as a whole roomful, SH Studio has everything you need to be the centrepiece of your virtual music making. SH Studio ships with a factory sound library of over 150 patches, many of which were designed by our good friend Anatol Locker. You can hear some of Anatol’s tracks here, and if you want to print your own synth, have a look at his day job here. 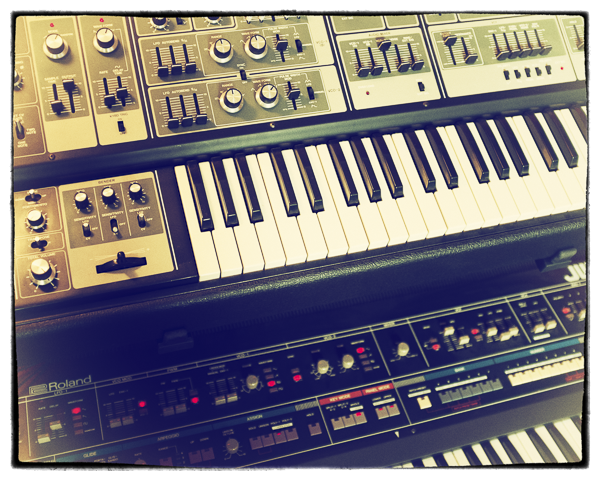 The Roland SH-7 sits in a place of honor inside the pantheon of synthesizer deities, and I’ve always been of the opinion that it could not be improved upon. That was until those delightfully mental designers of audio nirvana set their hands to work crafting the Rhythmic Robot take on this beauty. It was clearly a grand undertaking, and I do believe Mongo wore a necktie during the creative process. Albeit he had it on backwards and abandoned the double Windsor knot in favor of duct tape, but that should not detract from the fabulously fabricated fruit of this undertaking. Not only did RR mania pay a smart bit of homage to the original, it exponentially increased its legendary status. Like most people, when I get a new bit of synthesis playground, I explore the presets. It’s really the only ‘normal’ activity I do. The SH-Studio came packed full of presets that were full of wonder and sounded amazing. But, it also comes with knobs and switches and sliders and other such controllers that make things go boom in the night. So, I was compelled to channel my inner ‘child-on-an-elevator’ and play with all of them – at the same time – on the same base preset. And I had more fun than the kid who pressed all the buttons on the Sears Tower’s elevator in Chicago, IL. So, what makes this work. First the RR guys started with a perfect reproduction of the SH-7 oscillator circuitry (Mongo probably wore 2 neckties during this phase). Then they juiced it up a bit with the RR Audio Steroid (patent pending). But, a fine oscillator must have an even finer filter to support it, and SH-Studio was infused with a true gem of a filter bank and plenty of modulation to keep the bank busy. The end result is a sound that can range from choirs of angels to the growl of demons – I prefer the latter. The GUI is smart and intuitive, as well as, aesthetically immaculate. SH-Studio pleases the eyes as well as the ears. One of Rhythmic Robot’s many talents is to create a visual image that compliments the sound of the instrument it was designed to interface with. I do not hesitate to give it the top rating or to recommend it. I’ve only just got the SH Studio, so haven’t had time to get to grips with it yet. 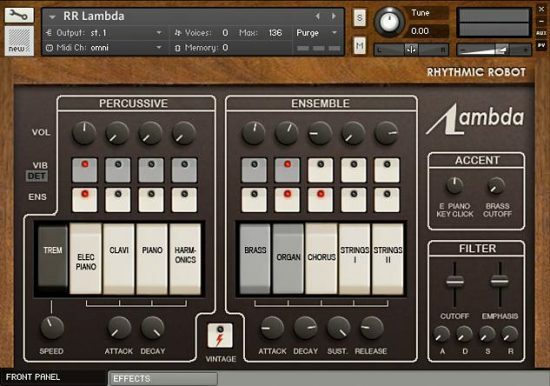 First thoughts – the factory presets are quite good, but you need to dive in to really get to grips with it and personalise the sounds. I’ve been using the glitch – which seems pseudo-random – the first two or three “random” patches always follow the same pattern (an organ sound, a noise sound, a very quiet bell sound) before going off somewhere random. I find the glitch a useful starting point (as with a lot of your instruments) – it gives you a crash course in the sections of the instrument when you think “that’s a good patch but how can I stop that note bending after the other notes stop?” Better than reading about it. I have a lot of your products – most of the lab instruments – and one thing I do a lot is to layer sounds. I like to layer Platter in with other sounds, as it gives a grungy other-worldly sound (like the sound of Fats Waller playing the organ in Eraserhead). Platter and SH Studio together sound great – as does Platter and Tubes & Wires, Platter and Shortwave, etc. Things like Cloud Chamber and Spaceman (which can be a bit weak by themselves) are great to add to other sounds to give that odd edge. I like to layer Haunted Piano or Music Box with a standard piano sound. And Spark Gap and Hurdy-Gurdy or Crank together can give a very penetrating lead sound. 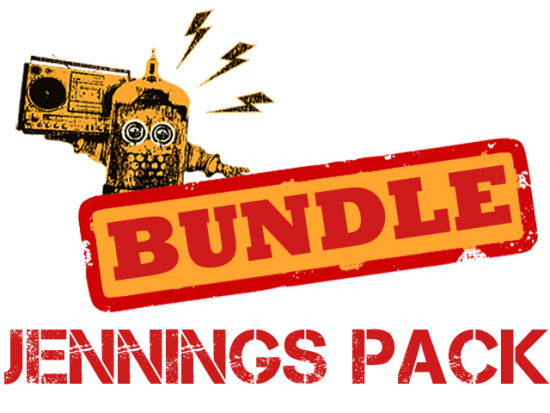 I’ve used a lot of Rhythmic Robot stuff in my recent Jumble Hole Clough recordings – have a listen to the Dandelion Radio album or Moth On A Staircase Window – they’re often in the background and/or layered, but you’ll recognise them ! I’ll send a more in-depth review of SH Studio when I’ve had the chance to use it in anger.